Mrs Manjula Master joined Unity 101 in 2006. She presents a show called Jhankar, which is a Gujarati programme, along with her co-presenters Nisha and Manisha, every Thursday 6pm to 8pm. Jhankar features recipes, riddles, what is going on the local community, along with rich variety of Gujarati songs. Her show witnesses a lot of phone calls from listeners with their song requests and inputs to the show’s topics. 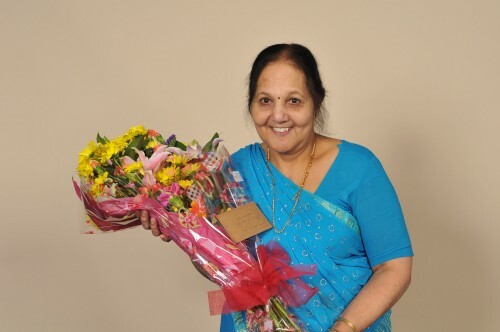 Mrs Manjula’s signature dish is Dahiwada and her favourite actor is Amitabh Bachchan. In her own words “Being a presenter on Unity 101 has given me an opportunity to talk and engage with the local people. Listeners have told me, when I meet them outside the studio, that they find me very respectful on the radio. At 74 years young, I am the senior most presenter with a very young outlook. I really love and enjoy being on Unity 101”.